I state in my Statement of Ethics that if I accept a review sample, I will disclose it at the beginning of the article. Please consider it disclosed. I’d like to thank Common Ground PR for providing this sample to me with no strings attached. 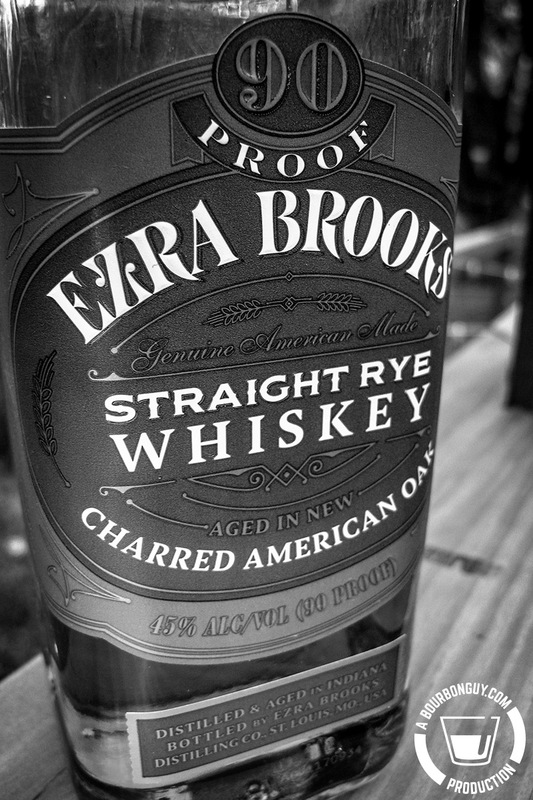 About a month ago, an email landed in my inbox announcing the new Ezra Brooks Rye. I was curious, but then I saw the Distilled in Indiana prominently on the front label. I needed content, and I love MGP's 95% Rye whiskey, but I wasn't sure that reviewing yet another would be all that interesting. Ultimately, I decided to pull the trigger and see about getting a sample sent, mostly because I'm liking the moves that Luxco is making lately. When I opened the box and saw that the product was only two years old, my expectations for this whiskey sank a bit. I know that rye performs better at a young age than bourbon does, but in the past, I have not been a fan of the ones I've had. I decided to spend a couple of weeks with this before writing my review. As they were kind enough to send a full bottle, the least I could do was run it through its paces in a variety of situations and glasses. From my first taste, I noticed something about this. It didn't really taste like your typical 95% MGP rye. There were certain family resemblances, to be sure. But it wasn't quite right, which got me to thinking. As production was scheduled to start later that April, the very first product off the still would be a few months shy of four years old now. Plenty old enough to blend a few different barrels together and end up with a product that had to be called two years old (remember you have to go by the youngest whiskey in the bottle). Is Ezra Brooks Rye one of the new MGP rye recipes? I reached out to Luxco's PR Agency for comment, and they were unwilling to give exact mash bill info. They did say that there was a little corn in the recipe, though. And that leads me to believe that at least some of the juice is the second recipe above. Is it all that recipe? Is there a mingling of two or three rye mash bills? No idea. What I do know is that it's from Indiana and has rye and corn in it. Oh, and that it tastes pretty good in spite of its age. Purchase info: This sample was provided by Common Ground PR, but I've seen it listed online for less than $20 for a 750 mL. Details: Two years old. 45% ABV. Nose: Cinnamon red hots, soap, brown sugar, and a faint citrus note. Mouth: Sweet and spicy. Honey, cinnamon red hots, clove, ginger, and lemon zest. Finish: Medium length with lingering ginger and lemon zest. Thoughts: This is young, but tastes pretty good in spite of that. I'm really enjoying the almost "ginger beer" quality of the ginger and lemon zest notes. I tried this in a couple of cocktails, and it got a bit lost. But on the other hand, I've enjoyed almost half the bottle neat to this point, so that says something I guess. If you see this somewhere, I'd recommend giving it a try. UPDATE: This post contains an update to clarify who's PR Agency confirmed the use of corn in the mashbill.